Join the 46 Gallon Challenge, install an ACT-E1 in your home and save 46 gallons of water each day without changing your lifestyle. The average four person family saves an average of 17,000 gallons a year, 1,416 gallons a month, 327 gallons a week, or 46 gallons a day in water by installing one ACT-E1 under their sink with no additional plumbing line needed. The revolutionary ACT-E1 pump delivers instant hot water to every faucet in the house, no matter the distance. The ACT-E1 will work with standard water heaters while the Autocirc 909 is specifically designed for tankless water heaters. Providing you comfort and peace of mind at an affordable price for many years to come. Not only do you save thousands of gallons of water, but energy as well. The ACT-E1 only runs when you need it and turns off when you don’t with a programmable timer built in. The savings will continue to build as you see your water and electricity bill get smaller. Take conservation to the next level, be proactive. The auto circ pump is installed under the sink or faucet farthest from the water heater – where hot water usually takes the longest amount of time to arrive. A built-in temperature sensor automatically turns the autocirc pump on when the water temperature in the hot water supply line cools down to 85º F. This cool water in the hot water supply line is then pumped into the cold water line and back into the water heater. The autocirc pump turns off automatically when the hot water supply line to the faucet reaches a temperature of 95º F, ensuring the instant availability of shower warm water with maximum temperature hot water only seconds behind. When the pump is automatically turned off by the built-in thermostat, an auto closure device prevents hot or cold water from mixing in either supply line. Another beneficial feature is that hot water will also be instantly available at all other faucets in the supply line between the water heater and the faucet where the autocirc pump is installed. Does not require a return line. Requires only 14 watts of power. Packaged complete with a 6 ft. long power cord. 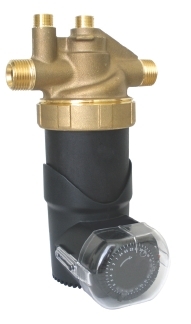 Requires only one pump and one installation for all fixtures on the hot water plumbing line. Has built-in fixed thermostat or an optional, adjustable thermostat. Has a built-in 24 hour timer which allows the selection of system operating periods to suit family usage. Saves the average family of four up to 17,000 gallons of water annually. Saves energy, money, water and pays for itself in a short period of time (see energy saving chart below).